I recently read Amanda Palmer’s The Art of Asking: How I Learned to Stop Worrying and Let People Help. I’d seen her Ted Talk video a few years ago and downloaded the book onto my Kindle and didn’t bother to read it until recently, mainly because the beginning of the book is so much like the video that I didn’t think it had much more to offer. And truthfully, the video gets the point across pretty well. After reading the book, however, I laid in bed and couldn’t think of anything I wanted. The things I could think of weren’t things anyone could give me. More time with my kids? Less need for sleep? Neverending peace and tranquility? Better dental insurance? The ability to eat a croissant without getting sick? A universal parking pass for all Seattle city street parking spaces? Do any of these things even exist? I keep wishing for a piano. Maybe this will work. Close this tab and do your homework. Craigslist is no place for kids. How can this even be fun for you? I’m sorry I said the word dammit, see how foul the Internet can be? Do your homework. Goodbye. 10- Because without it I won’t have well-rounded children and you can’t stand the idea of a future where people aren’t well-rounded. 9- Because maybe one of them is destined to grow up to be a performer and without musical skills they’ll end up being terrible performers and nobody wants to see that. 8- Because I have a terrible singing voice and you might feel sorry for my kids listening to so many dying-cat versions of “Happy Birthday” Seriously, we have a big family and that’s a lot of happy birthdays every year. 7- Because you never play it and it just takes up space and reminds you that you aren’t using it. It taunts you every time you walk past it, pleading “Play me” and you’ve realized that frankly, it’s just not your thing. Yes, it’s pretty to look at but it gets dusty and you could be using that space for a life-size Darth Vader sculpture or a big comfy dog bed. You know, something you’ll use, with all due respect (dog beds are super comfy). 5- Because you can’t remember the last time you gave away anything of value and this will feel good deep down inside. Seriously, when you drop it off you’ll see the most excited kids ever and you’ll never forget that warm-fuzzy feeling of brightening someone’s day. I know this from experience because I have given away tons of things and it feels AWESOME. I work for a grocery store and habitually bring sandwiches and salads and burritos to homeless people. I hand them out and feel like a princess. They see me coming and they KNOW they’re about to eat something tasty. I’ve also given away maternity clothes, baby clothes, home-made dinners, furniture, cash when I could spare it. Never a piano, though, unless you count the one that was left behind but that wasn’t a good feeling at all. 4- Because pianos are stupid. You don’t even know why you have this dumb thing in the house. It collects dust, no one ever plays it except when you’re trying to sleep and they bang on the keys and never finish a song and it’s driving you crazy. In the interest of your own mental health you’ve got to do something. I know just the thing. 2- Because it’s not even your piano. You inherited it or it was a gift or a previous renter left it in the house and you don’t even want it. 1- Because David Bowie’s death and that of several other musicians could be a secret message encoded to you from the universe telling you to avoid making music. You might live forever if you give it up. Just saying. I could be wrong. And finally, PLEASE. Pretty please. That’s a Hamilton. It’s humble yet beautiful and most importantly, it doesn’t look like it’s been sitting in someone’s basement out of tune for 20 years, with potential rat or termite infestations. Pardon my bluntness but I don’t want a crappy piano. I know that’s bold and “beggars can’t be choosers” but no one begs for a piano. I’m asking for a piano. When someone asks for something, they probably want something usable and in decent condition. If I were begging for a piano my priorities would need addressing because no one NEEDS a piano and shouldn’t beggars limit their begging to things like food or bus money or something they can’t possibly acquire without help? I actually COULD scrimp and save and browse the free ads and acquire a piano but I work full time and have kids to take care of and I shouldn’t even be staying up late to write this. But I am. And I’m asking for a decent piano and not begging for “any old piece of %$#@ that’s in your shed. Thank you. “Hi, my name is —-. 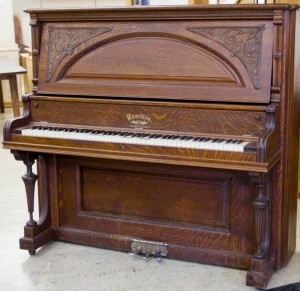 I have a piano and it’s in very good condition. It’s nearly perfectly in tune. Never been abused. Owned by only 1 family before me. I’ve wanted to let it go to a “good” house for about 5 years. I’ve been lazy. I’ve never advertised it. I looked into getting money for it and quickly realized from an internet search that it’s not really worth much because there were so many of these upright pianos made in the 50s and early 60s and they were built well and they don’t really “fall apart” and so there are tons of these aging beauties which makes the market saturated. How much luckier can a girl get? Also, if anyone has access to more time with my kids, less need for sleep, neverending peace and tranquility, better dental insurance, the ability to eat a croissant without getting sick, or a universal parking pass for all Seattle city street parking spaces then please have them delivered to my house, by George Clooney in a tuxedo. Thank you.